Wishing to learn more about what the neighbors have to offer, the leaders of Auburn’s hospital held their staff meeting at Auburn Village recently, then toured the facility. 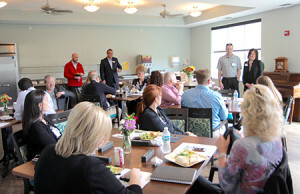 The chief executive officer and department heads of DeKalb Health — the non-profit, acute care, 56-bed community hospital that stands immediately west of Auburn Village on Wesley Road — gathered in Auburn Village’s sports lounge for their monthly meeting. During the visit, the leaders of Auburn Village also walked their counterparts from DeKalb around the recently renovated skilled nursing and rehabilitation facility. DeKalb CEO Tasha Eicher and her department directors took in Auburn Village’s new resident rooms, exercise and rehab facilities and more.